Ahead of the local body elections last year there was a slew of statements from council candidates about the importance of keeping, and attracting, young people in the region. Census figures show Marlborough has the highest proportion of over 65s in New Zealand, and the lowest proportion of under 25s, raising the question: what to do about it? More tertiary education, better work opportunities, a newsletter for young people who do leave; all have been discussed, little has been done. Some people say leaving is a rite of passage, so what matters is making Marlborough appealing enough to come back to, or move to for the first time. Marlborough Mayor John Leggett said he imagined the skewed demographics in the region would eventually become more balanced as young people moved to take up work. “Council’s role is making Marlborough a place people want to come and live, which is making sure we’ve got good community facilities and plenty of things for young people to do,” he said. He thought the strength of sectors such as the wine and aquaculture industries were creating jobs, providing opportunities for people to move to Marlborough or stay on in the region. Mayoral candidate and councillor Brian Dawson suggested a tailored newsletter, or more marketing for younger people about the perks of moving to Marlborough. He could not be reached for comment. Councillor Gerald Hope said there were strong marketing platforms for visitors to the region, but not for attracting younger people: something that could be about to change. The council was looking at extending the MarlboroughNZ.com website to include information about the cost of living, job opportunities and study options to help people considering the move. Hope said Marlborough had a combination of an ageing population and lower population growth than neighbouring regions such as Nelson, which needed to be addressed with more jobs for younger people. However, like Leggett he thought the region had excellent community facilities – the ASB Theatre, Stadium 2000 – and the introduction of the co-located colleges would be key for attracting young families. “There’s currently a perception about the quality of education in Marlborough, and it comes down to Marlborough Girls’ [College] versus Marlborough Boys’ [College],” Hope said. Councillor Laressa Shenfield said attracting and retaining young people was an issue across regional New Zealand, not just Marlborough. “We are competing with other parts of the country where salaries are higher, and we also have some issues with the rental market,” she said. Council was helping do this by supporting businesses through its Smart Business Marlborough programme, and providing funding for Business Trust Marlborough, she said. It was also providing funding for the Government-backed New Zealand Research Institute of Viticulture and Oenology, which Shenfield said would provide more jobs and educational opportunities. Councillor Mark Peters said one of the key ways of encouraging young people to stay in Marlborough was to provide more tertiary level study opportunities. He had discussed this with the Nelson Marlborough Institute of Technology, however he said he also wanted to approach other organisations to explore study options. Peters was also trying to find out more about school leavers to see how many stayed in Marlborough, as well as how many apprenticeships were available. “We’re going to need more tradesmen in the district and one of the best ways to do that would be to train more school leavers,” he said. 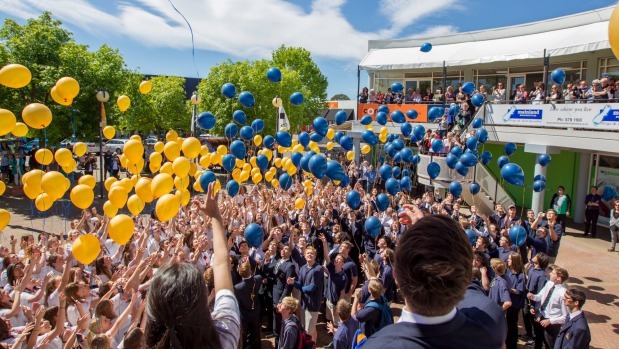 Marlborough Boys’ College assistant principal James Ryan said there needed to be more engagement between industry and the schools to provide career pathways for school leavers. He said he could count on one hand the number of students that had left for jobs in the wine industry since he started at Marlborough Boys’ College in 2014, despite knowing the industry was “crying out” for more workers. “There’s a very big gap between what schools do, and what industries want, and there’s very little conversation being had about that,” Ryan said. “Not many of our students are leaving to go on to do further study, ergo they must be doing something. Ryan said the solution would be ongoing engagement with key industries, to “simulate as much of a workplace in the school environment as possible” to show students career opportunities in the region and elsewhere. Previous Post:The Bachelor Recap: should she stay or should she go now?